With the Yuneec Gimbal Board for CGO3 Gimbal Cameras, you can replace a damaged or defective CGO3 PCB to get your camera back up and running. The gimbal board is a PCB that controls camera tilt and stabilization functions. 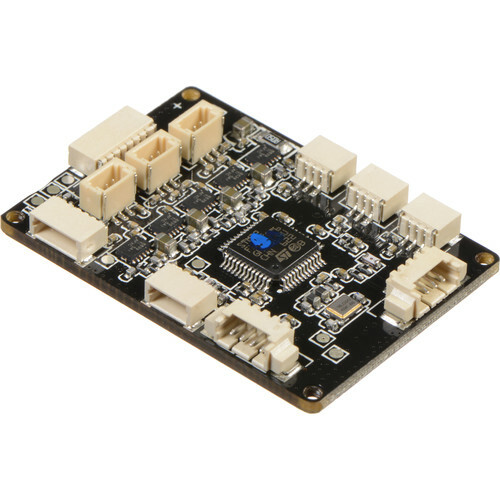 Box Dimensions (LxWxH) 3.7 x 2.0 x 0.3"
Gimbal Board for CGO3 Gimbal Cameras is rated 2.9 out of 5 by 7. Rated 2 out of 5 by Luis V. from Yuneec suport is missing for this product We buy 2 of those main board, the B&H service is 100% but the product have the same problem we have vide but the gimbal is dead, we reread a lot and the problem is that Yuneec have a Special Software GB Bootloader V16 that is necessary to give live at this main board. we have a service manual from Yuneec and call them several times and have not answer. this product have to announce that whit out this software is imposible fix the problem. Rated 1 out of 5 by Anonymous from Doesn't work This main board doesn't work on the Q500 4k. Rated 5 out of 5 by Ian from Exactly as labeled This is exactly as labeled. Nice to have parts available to make simple repairs yourself. Thanks B&H for the great product, at a reasonable price, and fast shipping! Rated 5 out of 5 by Anonymous from Got video back but gimbal won't work Crashed drone, figured it was main board so ordered it, installed this one and I got video back but still no gimbal function? No fault of product. Rated 5 out of 5 by Virgil from Job Done Job done and enjoying again with my Yuneec drone. The part is worth waiting for even though it take Months of waiting for it. Will this work for a CGO2? UNEEC YUNCGO3105SVC main Board is this board plug an play? No, this is not plug and play. After buy this you will have to pay 100usd for the calibration and this process with yuneec takes months and your camera can be lost by yuneec. YUNEEC YUNCGO3105SVC is this plug and play? No, you will have to send it to yuneec, they will send it to a 3th workshop and they will calibrate the board. I had to wait 4 months to get my camera calibrated. Dont buy here, you will have to send the camera and board to yuneec and wait 2 months for calibration.